Home > Regulations & Legislation > Will Donald Trump Slash Food Regulations? 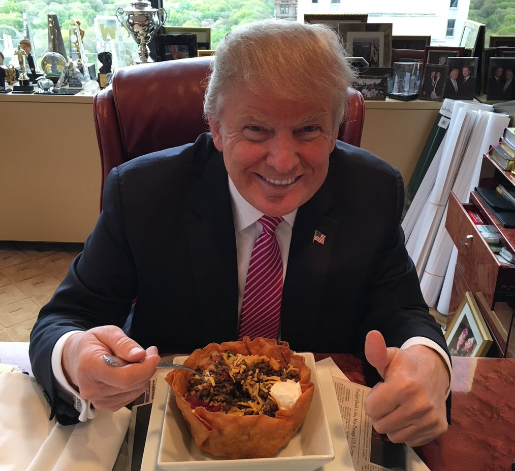 If there’s one thing Donald Trump loves, it’s a good taco bowl. But you can’t eat one that’s covered in red tape. Bad! Over the course of his controversial campaign, America’s new-fangled President elect accrued notoriety for railing against various pieces of US legislation. His pledges to repeal Obamacare and overturn Roe v. Wade were just portions of his overall critique of existing systems relating to the health and wellbeing of American bodies. However, among the many reforms which have seemingly fallen by the wayside, there is one that we may need to start worrying about again: his promises to crack-down on the US Food and Drug Administration (FDA). Back in September, Trump suggested the FDA was a burden on American economic growth. His particular grievances related to the fact that ‘inspection overkill’ was a costly business, paid for by dollars from taxpayer pockets. What’s more, he promised manufacturing would flourish if less regulation was in place. He pledged that, with fewer protections and regulations under a Republican government, American GDP would increase by 3.5%. Certainly the news would be good for manufacturers (if indeed they are feeling stifled by regulations). But, for consumers, the move would be bad. If standards were lowered, there would be less incentive for manufacturers to produce good, healthy foods, and more incentive to cut corners on safety. What’s more, there would probably be lower penalties and fines for recalls, and more dangerous food stuffs in an overall ecosystem where 626 food-related recalls are already occurring annually. Nevertheless, true to form, whatever changes Trump has in mind have not exactly been outlined in any great detail. We might believe his administration will reduce the FDA’s capacity to regulate dog food (even though such laws are quite important); but should we even speculate? After all, Trump has already U-turned on various campaign promises; without even taking office. Will Donald Trump, when push comes to shove, cut the regulatory power of the FDA? To answer in short: it looks more likely today than it did yesterday that he will. In the wake of a newly released video statement, which gave us a very brief brief regarding his plans for the first hundred days in office, one big promise shines through clear as mud: for every one piece of new regulation introduced, two pieces of old regulation will be scrapped. Trump might, therefore, be planning to follow-through with his pledges to cut red tape in the American business sector. However, exactly where the old regulations will be culled remains anybody’s guess. Indeed, the original fact sheet released with his ‘food police’ remarks has been removed from Trump’s website since the election results. Is it a case of cards to the chest? Or is a total lack of direction prompting the U-turns we’re presently seeing? Whatever the case, one thing is looking likely: regulations in America will be going at some rate, from somewhere. Further details, however, will be announced as they develop.